The perinatal mortality rate (stillbirths from 24 weeks’ gestation and first week neonatal deaths) in the UK is now less than 10 per 1000 total deliveries. The obstetric and paediatric causes of perinatal death for Scotland are shown in Tables 8.1 and 8.2. In the “unexplained < 2500 g” group in Table 8.1 premature labour or preterm rupture of membranes is present in 30% of the cases. 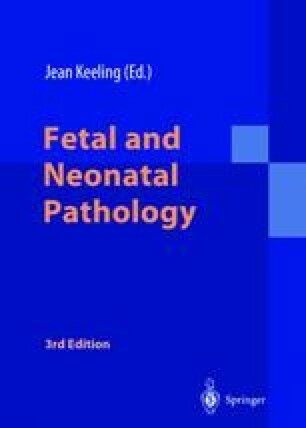 In Table 8.2, problems of prematurity are second only to congenital abnormalities as the cause of neonatal death. The latter may be influenced by selective termination but any further decrease in perinatal mortality will rely on our ability to reduce prematurity and its problems. However the proportion of babies delivering preterm (before 37 completed weeks’ gestation) remains constant at around 6% of all deliveries. Preterm babies contribute significantly to the workload of a neonatal unit.